Brothers Alan and Steve Freeman have been long time fans of Krautrock etc. as well as record shop owners specializing in this and similar music, and publishers of Audion magazine. This labor of love started well over 10 years ago to document Germany’s musical output. Originally available as a book published in 1996, the additional ten years of work has helped to flesh out a lot of information on German rock and experimental music scenes. There is a version you can access for free on the Ultima Thule web site, but that may not always be convenient. Due to popular demand the Freemans have now issued this excellent guide as a CD-ROM. All you have to do is copy the CD-ROM to your hard drive and you can access the information at any time. I have it installed on my laptop and it is very convenient, especially when researching music I am reviewing for Exposé. The information contained in this guide is staggering. There are thousands of extra pictures, an album’s worth of music samples, tons of bonus appendices, and bonus features (sections on Austria, Switzerland, the former DDR; references to other countries and musicians related to the German scene; and focused information on Beat, Avant-Garde, Folk, New Wave, Synth Music and other related genres). There are promo videos from four Krautrock legends: Embryo, Guru Guru, Faust, and Xhol Caravan. In order to fit on the disc, these are small format videos, and considering the age of most of them (30 years old), the quality is quite good. There is also a Faust video from December 2007 that you can tell is digital, but the volume was so loud that there is a lot of distortion. The music samples available are from Embryo, Ethno Leaders, GAM, Guru Guru, Kontrast, Mythos, Neumeier-Genrich-Schmidt, Orange Peel, Out of Focus, Rollkommando, Günter Schickert, Schickert & Strodthoff, and Xhol Caravan. In addition there are samples from Ultima Thule releases by Aussenminister, Con-Herz, Peter Frohmader, GAM, No Zen Orchestra, Out of Focus, Günter Schickert, Conrad Schnitzler, and Asmus Tietchens. The non-Audion samples are either live recordings or unreleased material. And then there are audio interviews in English with Christian Burchard, Manuel Göttsching, Michael Gunther, and Chris Karrer, a video interview with Alan Freeman, and interviews with Brian Barritt, Florian Fricke, Peter Frohmader, Wolfgang Hertz, Lightwave & Paul Haslinger, Mario Schönwalder, Klaus Schulze, and Space Explosion extracted from Audion magazine. From the Home Page you can go directly to a band you want to research by clicking on the appropriate letter of the alphabet. You then go to a page that contains links to the bands with that letter. Each band page is then linked by keywords to other bands or genres. The Home Page also has a panel on the right that links you to References, Related Information, Other Genres, the Index, and the Appendices. It will take me years to fully explore this mountain of information. All that I can say is bravo to the Freemans for making this monumental effort to document this extremely important slice of musical history. And to make this deal even sweeter, there are two CDs included with the CD-ROM package: an Audion sampler titled The Cosmic Auricle & Other Eggshells which is only available with the CD-ROM and a Garden of Delights (GOD) sampler Psychedelic Underground 13. The Cosmic Auricle features tracks by Alan Freeman, Endgame, Günter Schickert, Triax, Extremities, Con-Hertz, Out of Focus, GAM, and Alto Stratus. The GOD sampler includes tracks by Waniyetula, Missus Beastly, Vikings Invasion, Live, Arktis, Level, Emma Myldenberger, Skyline, and Guru Guru. 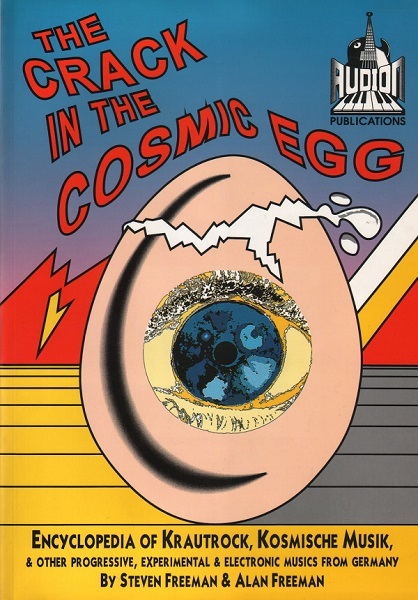 The Cosmic Egg is quite a package and a bargain at twice the price. It is an important resource for anyone even marginally interested in this music. Other resources like Julian Cope’s book only pale in comparison.